Not a fast, but was simple task. During the buying process of my chopper I noticed that the peanut tank had cracks around the tank mounts. It was easy to spot because of the bondo all around it. There was bondo out the ying-yang on the cycle. Although it did add rust to the underlying curves, it did look good. 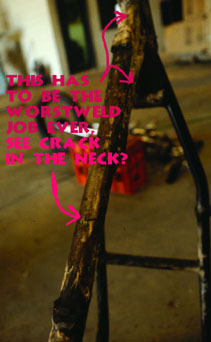 After I stripped the bondo off the frame and from around the tank, you could see a visable crack around the frame neck. Well, that is all I had to see to know that some major surgery was in order. In the following pictures you will see the proceedure used to modify the CB 750 Rigid Frame. They do not start or finish from the complete motorcycle, but are just a simple story of what was done. No actual action shots are here. Hope you enjoy, The REDBIRD.